They may not be as pretty as Rachel, Ross, and the others from the hit sitcom, but I’ve got my own batch of really special friends, that are the absolute best perk of doing this publishing thing. When I was unable to make it to the New York Comicon literally at the last minute (don’t ask! ), all the (very expensive) plans we’d made for the show could’ve crumbled, if not for the able assistance of my buds who were there. 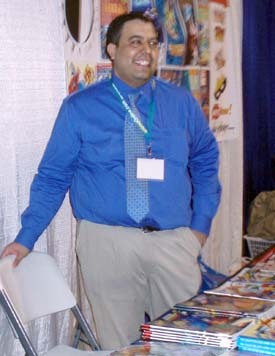 First is rambunctious Rand Hoppe, who’s been our webmaster since the beginning, and is head of the Jack Kirby Museum. With the help of capable Chris Irving (and Chris’ buddy Chris. R. Notarile), all our boxes of books made it to our booth, and both Rand and Chris helped out the whole weekend. Then, gorgeous George Khoury (shown above, looking sharp) filled in for me all three days, fearlessly fielding non-stop questions from our legion of fans who wondered, among other things, where Roy Thomas was (Roy was a last-minute no-show as well). Not to be forgotten is awesome Adam McGovern, who subbed for me at the Marvel Bullpen panel, andâ€”by all accountsâ€”did a great job tossing out questions to Stan Lee, Joe Sinnott, Gene Colan, and Flo Steinberg. So thanks to these gracious gents, a potential disaster was averted, and the convention was a marked success for TwoMorrows. I am eternally grateful to all of them for saving TwoMorrows’ hash in a tight spot. I’m really sorry I missed the show, as everyone I’ve talked to had a great time. But we’ll see you there next year for sure! 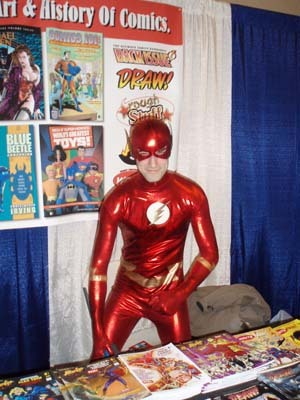 Now just one question; who was that “Flash” that was hanging out at our booth on Saturday? This entry was posted in TNT on 26 February 2007 by Mr. Morrow.